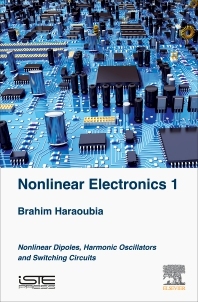 Nonlinear Electronics 1: Nonlinear Dipoles, Harmonic Oscillators and Switching Circuits deals with the appearance of nonlinear electronic circuits and their behavior. The book studies a number of circuits that interface between analog and digital electronics, including astable, monostable, bistable, Schmitt trigger, and analog-to-digital and digital-to-analog conversion. Users will find a complete resource that deals with all aspects of these circuits, starting from the discrete component and gradually working to the integrated circuit. Brahim Haraoubiais University Professor. He has worked in several universities, including French and Algerian.He is the author of several publications, patent patents, and academic books published in the field of research and pedagogy.He is also Professor at the Higher School of Technology and at the Higher School of Air Defense Territory (Algiers).